"Things will never be the same as they were just a year ago. For any of us," I wrote this time last year. I was almost right. For while 2016 was the year of major changes - Brexit, Trump and the victory in Aleppo being the three I would dub the most important - in one corner of the world the Atlantic Empire still reigns supreme. Serbia is still in thrall of a regime determined to redefine the depths of servility. Its history is still being written by its enemies and kangaroo courts determined to trample all decency in their crusade for global dominion. The Empire has even stretched out its hand to Montenegro, wanting to complete the conquest of the Adriatic. In that path of that conquest they ran into Russia, which refuses to dishonor its WW2 dead. 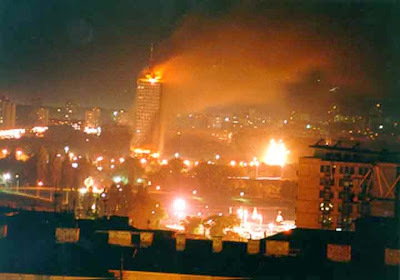 Moscow seems to have learned the lessons of Yugoslavia, even if Serbia itself has not. Of course, everything the Empire touches turns to rot, but why worry? It is the natives that suffer all the consequences, and the Imperial leadership that gets all the worshipful attention. Or so the thinking went, until someone appeared to skewer the sacred cow by proposing to restore the Republic. Those absolutely convinced it was their destiny to rule the Empire refused to learn anything, and kept wallowing in evil in order to maintain the chaos they called order, the desert they called peace. They were so convinced their triumph was ordained in the stars. They failed. Oh, how they failed. First the British, then the Americans took the off-ramp from ruin that history seldom offers. Now the Imperial elites are flailing about in panic, shrieking conspiracy theories and hatching hapless plots, while Russia holds the high ground. It is Christmas in Aleppo now, and everywhere the blood-dimmed tide of Empire is receding. Wake up, my people. We have work to do.